What Ever Happened to Mundt Madness? Johnny Mundt had an explosive freshman year and was turning heads nationally. However, when he was a sophomore during the 2014 season, Mundt seemed to have fallen off of the map. Sure, everyone can understand that Mundt was the second string behind the Ducks’ amazing tight end Pharaoh Brown, but why didn’t he have the same amount of playing time in 2014 compared to his freshman year? Height and skill between the two tight ends were definitely a differentiator, as Mundt stands at 6-foot-4 compared to Brown’s height of 6-foot-6. 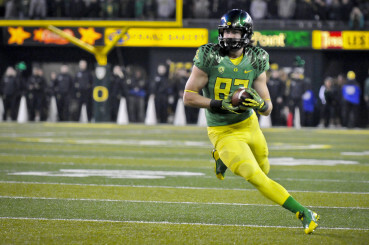 Brown also had 19 more total receptions than Mundt during his career with the Ducks. Brown’s injury that happened late last season raises uncertainty whether or not he will still have his explosiveness for he upcoming 2015 season. So what exactly does this mean for Johnny Mundt? Johnny Mundt carries the ball in a game against Oregon State in 2013. The 6-foot-4, 250 lb. 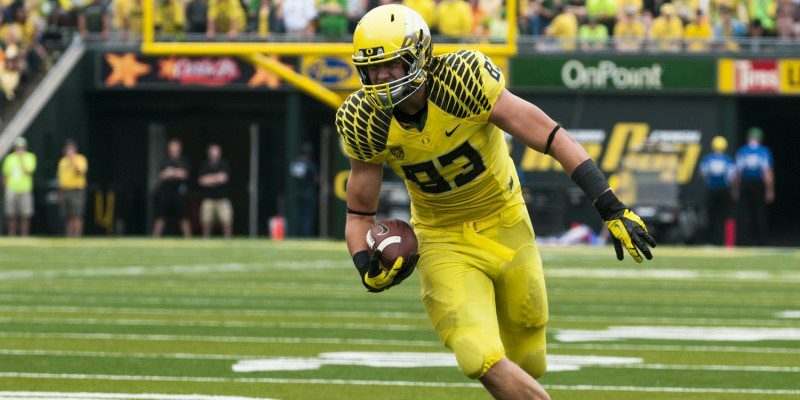 tight end has the skill to be an integral part of the Ducks offense, but no one has been able to see his full potential due to Brown’s breakout season. Who can forget Mundt’s come out party during the Ducks game against the Tennessee Volunteers? Mundt ended the game with five receptions with a total of 121 yards, averaging 24.2 yards per catch. He was also able to bring in two touchdowns in that game, as well. With many changes coming to the offense at quarterback and at wide receiver, we could see Mundt get more opportunities throughout the upcoming season. Changes in offensive schemes could open up more playing time for the junior, which will present him with more opportunities to rise to the occasion and become the starting tight end for the Ducks.